Please note, the book is a biography of Martin Luther. I’m not reviewing Martin Luther. Also, today’s book was provided by Cross Focused Reviews. Some years ago, a blog tour first brought the Christian Biographies for Young Readers series into our home. Now, they have become a fixture in our learning processes. The most recent entry in this series is Martin Luther. (Isn’t nice how easy it is to title a biography?) Simonetta Carr has again provided more information in 64 pages than one would have thought possible. First, she does an excellent job providing an overview of the complicated situation of the sixteenth century, including the selling of indulgences by the Church at the time. Carr’s summary uses some terms that are anachronistic (I doubt Luther considered his work to go “viral,” p. 22,) but these terms make plain the meaning. Second, the history reads like I am familiar with from much more in-depth books. For a 64-page children’s biography, the detail is excellent and, more importantly, accurate. I would love to see a footnote or two (and, since it’s a children’s book, I’d take an endnote) with more information about a few details. 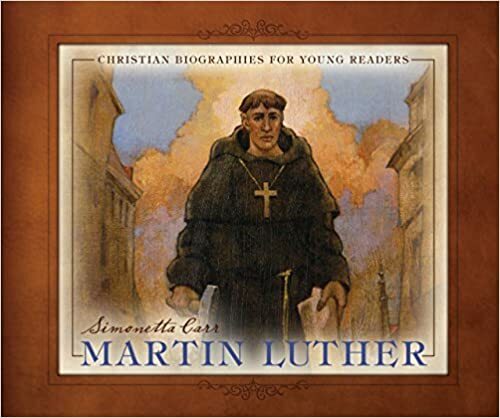 I would love to see a bit more about Luther’s later life, but I know that the managing and leading of the Reformation gets into some minutiae that does not read well for children. The ending few pages work through a series of paragraphs giving insights into his later life. In all, I highly recommend not only Martin Luther but the entire series. Hardcover, well printed, good-feeling paper. 64 pages from Reformation Heritage Books.